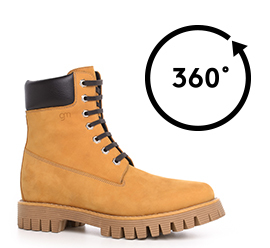 Elevator boots with yellow waterproof upper in fine full grain nubuck leather, collar in dark brown calfskin and tone on tone rubber sole designed to be extra durable. A timeless iconic boot inspired by the urban style. The inner elevator system up to 4 inches ( 10 cm) ensures a shock absorption effect which provides all-day exceptional comfort and support.